Don't Disconnect by Tiffany Campbell is an inspirational romance that is multilayered, entertains and motivates. Dominic “Kole” Sommers has been away since she was eleven. But life hasn’t been all milk and honey for her. She’s had her challenges to face, living far from home. At twenty-two, she hits rock bottom — she is homeless and utterly lonely. Forced by her present predicament, she makes the call to the one person she’d never have wanted to see again — her mother. She returns home to her old place, filled with memories, most of which she doesn’t want. But coming home also means reconnecting with the one person who has always meant a lot to her: Jesse Palmer. But how long does Jesse have to live? Tiffany Campbell’s novel is a powerful story that combines faith and love to remind readers of things that are essential in life. Readers will love the way the theme of faith is developed and it is not difficult to see oneself in the uncertainty that Kole experiences: “My heart fluttered at the thought but my brain wouldn’t allow me to accept the concept. How can I believe God exists, when so much has happened to me throughout my life? No way an all-knowing God could just sit and watch all that happened and be okay with it. There’s no way.” I enjoyed the realism in this story. I enjoyed the fact that the characters are so real and that readers can feel and hear themselves in these characters. Don't Disconnect is written in the first person narrative and this narrative voice pulls the reader irresistibly into the worldview of the protagonist. The author is a master wordsmith of natural-sounding and intelligent dialogues. In fact, the dialogue starts from the very first paragraph of this entertaining book and it is very revealing of the characters. The writing is good, clean and very accessible. There is a lot to enjoy in this story. I loved the spiritual journey of the protagonist even more than the physical one. Evicted from her apartment due to her roommates’ poor spending habits, Dominic "Kole" Summers finds her quest to gain control of her life after incarceration takes a double spin when she is forced to accept the generosity of her estranged birth mother. After what her mother allowed a boyfriend to do to Kole, there was no way she could agree to this unexpected mother/daughter reunion. But, that was before her return to familiar roots brought her face-to-face with her childhood friend, Jesse Palmer. As gorgeous as ever, Jesse’s devotion to her had not changed; but his spirit had. Jesse had found purpose in his life, as had Kole’s mother and new stepfather. With their constant assurance and determined faith in God, Kole embarks on her own journey into unfamiliar territory. Tiffany Campbell’s novel Don’t Disconnect brings to light an unusual twist on a modern young adult scenario. As the story evolves, the plot reflects the main character’s growing faith after the struggles of a cruel and abusive childhood. The reality demonstrated in Campbell’s words is powerful. Not only does the author touch on the ever-growing theme that was brought to the big screen with the success of John Greene’s A Fault in the Stars, I feel that this area of health concern among young readers to be highly relevant. Tiffany Campbell incorporates a much neglected area of spirituality that offers the reader a stronger sense of hope than the moving passages of cancer treatment. This is sincerely a story of hope, a wonderful story. 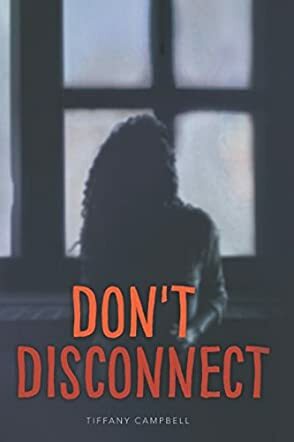 Don't Disconnect by Tiffany Campbell is the story of a woman who ran away from home, but life brought her back to where she started. Her name is Dominic "Kole" Sommers and she is unlike any other woman you might have met or read about. With a chip the size of Mars on her shoulder, Kole knows that no one does anything for free. Even the people you trust the most have the power to hurt you. She was alone when she was 11 years old and that has not changed now that she is 22 years old. However, life has brought her to a point where she has to go back to the place she hates: she has to go back home. Amidst the old pain and old wounds, Kole is just trying to breathe and get through one day at a time. But there is someone in that place that has always been a bright star: Jesse Palmer. He is showing her a side of life she had no idea she was capable of. She is happy and she smiles when she is with him. But will she give Jesse a chance to show her the true potential of love and happiness? Or will she let her past override her future. Don't Disconnect by Tiffany Campbell is a very emotional novel that you will instantly connect with. The story is very powerful and you will just fall in love with Kole and Jesse. Kole had a wonderful character development, her growth from an emotionally scarred woman to a woman in love and brave enough to express it was just amazing. I loved the way Tiffany expressed her story, I love how she mentioned the story of an African American girl and made it every girl’s story. Very well-written and composed. I loved reading it.